Aging of the brow or forehead can leave a person with a tired appearance suggested by drooping of the eyebrows. As the eyebrow becomes lower and the upper eyelid skin also becomes lax and hooded, further accentuating the fatigued appearance. The sensation of heaviness in the eyelids may lead one to consciously raise the eyebrow with the forehead muscles, thus furthering the aged appearance by producing a wrinkled forehead. Thickening of the eyebrow muscles may give a more masculine appearance and, in extreme cases, a stern or angry expression may be interpreted though the patient is neither. These subtle changes may occur independently or along with other evidences of facial aging. Marked improvement can result from lifting the forehead to rejuvenate the tired appearing face, while relaxing the thick muscles to soften the stern or angry frown lines. 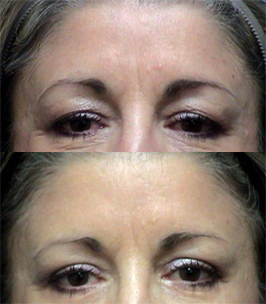 A browlift may be done independently or in conjunction with another facial procedure such as a facelift or eyelid lift surgery to achieve the desired look. Significant advances in the treatment of forehead wrinkling and muscular thickening using fiberoptic technology allows improvement with minimal scarring and discomforts. The endoscopic forehead lift is performed through very small incisions hidden behind the hairline. Browlifting and forhead rhytidectomy procedures are done in the operating room on an outpatient basis. 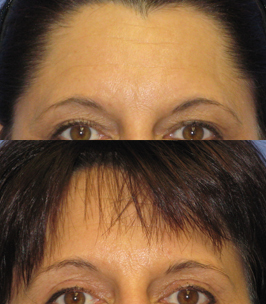 The Browlift is accomplished using only local anesthesia and mild sedation. General anesthesia is not required and may lead to increased swelling, bruising, and the need for post-operative drainage tubes. Additionally, the brow and forehead must be fixed in a position for at least 2 weeks to maintain the aesthetic result. This is elegantly accomplished using bio-absorbable fixation devices. 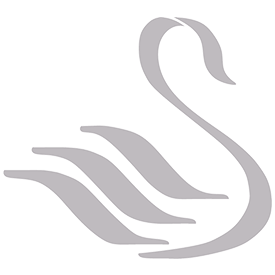 Patients are able to return to work in less than a week. Brow lift surgery is performed as an out-patient procedure. Two or three tiny incisions are made up in the hairline. Dr. Howard uses these tiny incisions, about ½ inch each, to access the brow. The brow is lifted into ideal position and fixated with tiny absorbable screws at the incision site. These absorbable screws dissolve in a month or so. The small incisions will be closed with removable sutures which will be removed in approximately 4 or 5 days. The recovery for this procedure involves ice compresses on he forehead and eyes since gravity will tend to bring the swelling down into the eye area. Some patients experience mild to moderate pain usually accompanied with a headache. Medications will be prescribed to help alleviate this pain during the recovery process. The costs for this surgical procedure begin at $2500. It is very rare for insurance to cover this procedure. Insurance will only cover this procedure if the patient has significant “visual field” obstruction as a result of a dramatically lowered eyebrow. Your eye doctor must perform a “visual fields” test documenting this obstruction. The results of this test will be submitted along with photos and a letter from the doctor recommending the procedure to be covered as “medically necessary” under the terms of your health insurance contract. The terms of your insurance contract are between you and your health insurance carrier. Many health insurance contracts specifically state blepharoplasty and Brow Lift as non-covered procedures. Please refer to your health insurance contract for details regarding coverage.